Year 1/2 have been leaning about their local environment. Duffys Forest Vegetation Community is found exclusively around Sydney’s Northern Beaches. It is listed as an endangered ecological community and is protected under the Threatened Species Conservation Act 1995. The students have been using a program provided by Warringah Council to raise awareness about threatened species found in Warringah. The program aims to educate students about the values of urban bushland and in particular about the endangered vegetation community of Duffys Forest. As a part of the program all the students of the school got to participate in a workshop provided by the council and presented by Leonie Maddigan. 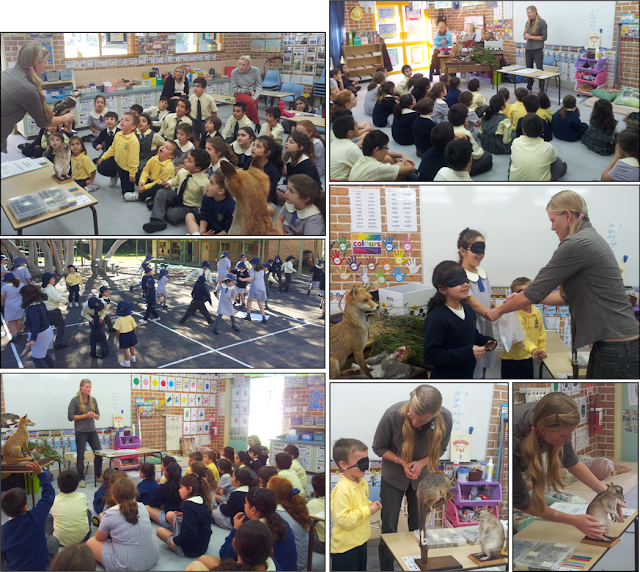 In the workshop the students were provided with an overview of the types of bushland found around Warringah. They were shown how our use of bushland has changed over time. Students were introduced to some of the plants found within the Duffys Forest community and shown the different plant layers. They leant about the types of animals found in the bushland and the basic habitat requirements of these animals. The children were given an understanding of the threats and dangers that are impacting on Duffys Forest Vegetation Communities and other types of bushland. Leonie was able to make all this learning fun by bringing along examples of our native plants and animals and engaging the students in great games which taught them about plant layers, different types of vegetation and how animals come under threat. It was a fun packed morning full of varied learning experiences. 2ND DEBATE = 2ND WIN!! JELLY TIME IN PREP/K CLASSROOM!